The latest Willard Bishop SuperStudy, like previous ones, confirms that the magazine and book categories generate outstanding profitability and other financial payoffs for supermarket retailers. The study also underlines the benefits of magazine buyers’ attractive demographics and basket-building power — and identifies significant opportunities for drawing new shoppers to the category. During the 2017 MBR Retail Conference, Tom Griffith, director, Willard Bishop, presented a summary of the results for the magazine category, along with some highlights on the book category. Bishop did a 52-week, full-store (all SKUs, categories, areas of the store) analysis of four stores in each of three chains: Kroger, Ahold and Safeway. 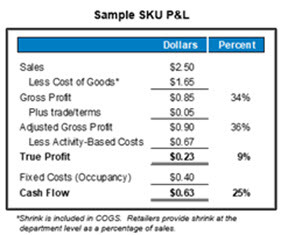 Item-level profit and loss statements were produced for every item in the store. In addition, the study’s “cash flow” metric quantifies cash generated after excluding fixed costs (cash flow = true profit plus occupancy costs). Both magazines and books show very strong per-unit and true-profit performance — and magazines are even stronger on a cash flow basis. *Compared to key competitive categories, magazines have the highest true profit in dollar terms: $308, versus $288 for candy, $80 for gum and negative true profit (-$508) for carbonated beverages. Books’ true profit comes in close to gum, at $70. *Magazines and books have the highest true profit margins: 18.3% and 13.9%, respectively, versus 6.4% for gum, 3.1% for candy and -3% for carbonated beverages. Magazines’ adjusted gross profit per unit sold is $1.70, and books’ is even higher, at $2.69. In comparison, per-unit adjusted profits for gum, candy and carbonated beverages are $0.58, $0.54 and $0.23, respectively. Magazines’ true profit per unit sold is $0.97, and books’ is again even higher, at $1.13. In comparison, true profit per unit for gum, candy and carbonated beverages are $0.11, $0.06, and -$0.07, respectively. * Magazines’ true profit per square foot of facing (SFF) is $1.12, and books’ is $0.78. In comparison, true profit per SFF is $1.06 for gum, $0.76 for candy, and -$0.84 for carbonated beverages. Magazines’ cash flow — $427 — is slightly above carbonated beverages’ $426, and more than double gum’s $202. Only candy has higher cashflow in dollars, at $908. “But retail space optimization requires looking at the ‘tail’ of space productivity curves, to make space tradeoff decisions among categories,” pointed out Griffith. It’s critical that retailers identify the worth, in dollars and profit, of each foot of space of each category, to understand the true results of incremental space for each, he stressed. Bishop’s analysis found that, in part because of their low costs/DSD and SBT advantages, both magazines and books continue to add cash flow and gross profit even as their footage is increased significantly. In contrast, with candy, higher category costs mean that cash flow begins to decline — and eventually goes into negative territory — at fairly low thresholds when incremental space is added. For retailers, selling even one more unit or copy of high true-profit products — like magazines — is “most impactful, because it goes right to the bottom line,” Griffith emphasized. With magazines, raising unit volume by just 5% results in true profit dollars increasing by 9%, or $1,439 annually. As noted above, as a DSD category, magazines incur very low labor costs for retailers. 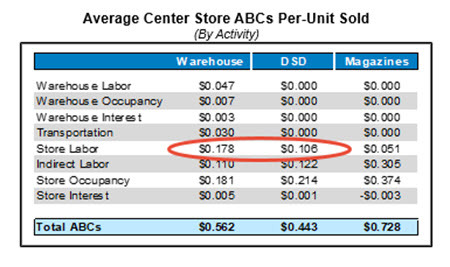 The average DSD product saves retailers $.07 ($0.178 versus $0.106) cents per unit in direct labor costs than warehouse-delivered items. Magazines incur only $0.051 in direct store labor per unit sold. In addition, as an SBT category, magazines save retailers $2,027 in store labor and $85 in inventory carrying costs per store. The Labor savings reflect reduced receiving and scan-outs in the store, and interest costs are actually negative because the retailer receives payment from customers before he pays the vendor. Seven percent of all shoppers purchase magazines — and those shoppers produce 28% of total store revenues. The average basket value when magazines are present is $68.29 compared to the average basket of $34.42. Given magazines’ profitability metrics and their increased cash flow benefits with incremental space, retailers, as well as the category, stand to gain from collaborating to leverage opportunities to engage the other 93% of shoppers and get more magazines into small baskets, Griffith concluded.